Sometimes `sizes` is quite important. I just read your article Responsive Images: If you’re just changing resolutions, use srcset. In the age of “responsive websites,” srcset does not help in certain situations. For example, I have a popular products slider. On mobile, I have one image per slide where the images are 320px wide. On desktop, I have six images per slide where each is 160px wide. So the desktop images are smaller on desktop, not bigger. How do I handle this situation with srcset? I tried to be careful with that post title: “If you’re just changing resolutions, use srcset.” In this case, we’re changing the size of the images not just at certain resolutions, but at specific breakpoints as well, which means we’re also going to need to use the sizes attribute to get the most out of responsive images. The entire job of the sizes attribute is to tell the browser what size the image will be shown at, as per our CSS. A demo! Resize the width to see it alternate between the “Desktop” and “Mobile” views. See the Pen Responsive Images Slider by Chris Coyier (@chriscoyier) on CodePen. As the email mentioned, the “Desktop” version actually renders the images smaller (160px) than the “Mobile” version (320px). Notice we’re not yet using the sizes attribute. Browsers will assume you’re probably going to render this image at 100vw wide. 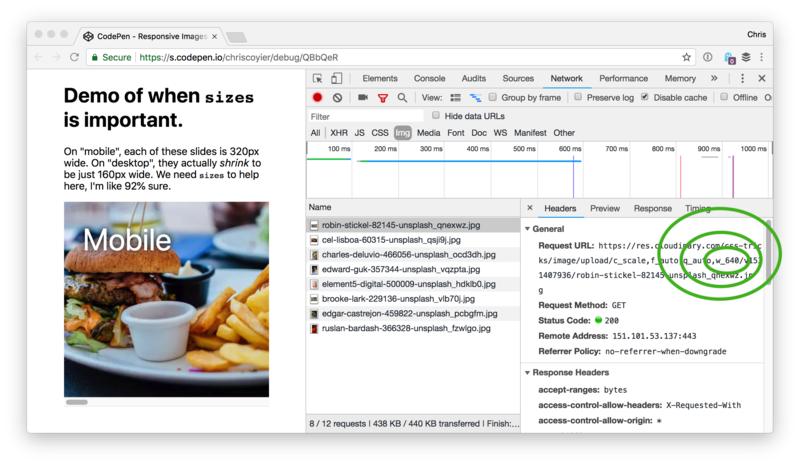 That’s unfortunate because the browser may download a larger image than it needs, which is what we’re trying to fight against with responsive images in the first place. On my 2x desktop display, I can tell it’s downloading the 640px version, but it really only needs the 320px version. You’d think the browser would know that, and it does — it just needs to download and parse the CSS first. The browser wants to make a decision about what to download faster than that. So, let’s tell it with the sizes attribute. The browser is now only choosing to download the 320px version, which is correct on a 2x display where the images are being rendered at 160px. We’re back to downloading the 640px version, which is correct, since at this viewport size, the sizes attribute is telling the browser we intend to render at 320px and we’re on a 2x display. Firefox does exactly as described above. Chrome does too, except that it will always use the larger version if it has that version in cache. So, if it has a 640px version in cache, it knows it really only needs a 320px version, but since it doesn’t have a 320px version in cache, it’ll use the 640px version instead. Safari does too, except that after it has made its choice, it never changes (like if you resize the browser window). An interesting part about srcset is that the spec allows it to make choices however it wants, perhaps using stuff like network conditions to decide. 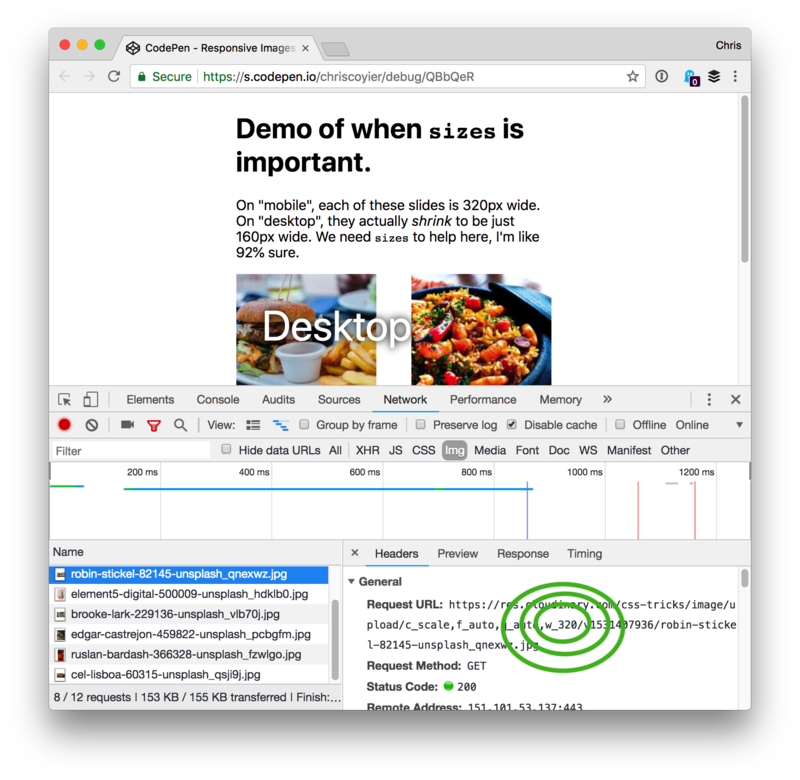 Most browsers don’t do anything like this yet, except Chrome which downloads the smallest resource should it get a Save-Data header on the HTML document. Joe McGill also noted: “For older iOS devices that don’t support w descriptors in srcset, the first source item in the list will be used, so you may want to lead with your preferred default size if you’re supporting legacy iOS devices.” In other words, those older iOS devices may have supported earlier syntaxes of responsive images, but only with x descriptor (like big-image.jpg 2x), so perhaps specify a good default image as the first in your srcset. See the Pen Responsive Images Slider by Eric Portis (@eeeps) on CodePen. I snagged those food photos from Unsplash. I uploaded them to Cloudinary so that I could use URL params to resize them instead of having to deal with that myself. They are all squares, not because I downloaded them like that, but because I sized them that way in CSS and prevented squishing with object-fit. That means image data is being downloaded that isn’t needed, so I either should have cropped them myself or used Cloudinary URL params to do that. I used the Pug HTML preprocessor for my demo just to reduce code repetition.
" sizes="(min-width: 600px) 160px, 320px"/><img srcset="
The post Sometimes `sizes` is quite important. appeared first on CSS-Tricks.